When there is a chance of further negotiations with a lead, it can be converted into an account, contact, optionally an opportunity. In short, once the lead status has reached a certain stage, it can be qualified as a potential. On conversion, all the lead details are transferred in creating an account, contact and optionally an opportunity. The lead conversion process is a manual process, if you want to automate it then you have to use Apex code. This article will help you to understand how to automate lead conversion process using the Process Builder. Let’s start with a business use case. Pamela Kline is working as a System administrator at Universal Containers (UC). She had received a requirement a to auto convert marketing qualified leads (i.e. leads with Rating equals Hot) and create an account and contact record. There are few possible solutions for the above business scenario, but I’ll use Apex and Process Builder to solve this. Before proceeding ahead, you have to understand LeadConvert Class in Salesforce. To call an Apex method, add Apex action to your process and select an Apex class with an @invocable method Annotation. It allows us to extend the Process Builder by writing Apex code that meets certain criteria and then invoking the Apex from our Process. If the class contains one or more invocable variables, manually enter values or reference field values from a related record. @InvocableMethod Annotation support bulk operations. Now, we have to understand a new Apex annotation i.e. @InvocableMethod. This annotation lets us use an Apex method as being something that can be call from somewhere other than Apex. 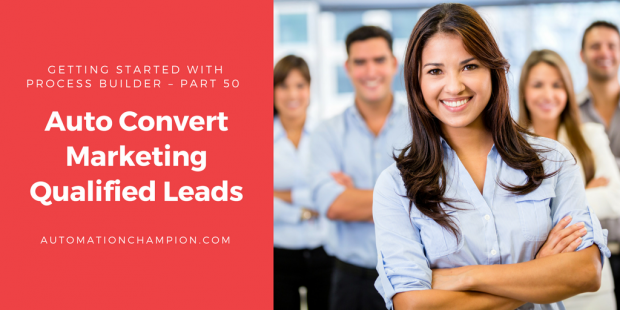 The AutoConvertLeads class contains a single method that is passing the ids of the Leads whose Rating changed to Hot. Create the following class in your organization. Modify the above class as per your business requirement. Follow the below instructions to create a Process for the above business requirement. 3. The next task is to add Process Criteria, To do this click on Add Criteria, enter Name, Type of action and set filter conditions (In this case set [Lead].Rating Equals Hot as shown in the following screenshot. 4. The next step is to add an Immediate action to Process. Click on Add Action (Under Immediate actions), Select the type of action to create (In our case Apex), and then fill out the fields to define the action, as shown in the following screenshot. 2) Now update the Rating to Hot, as shown in the following screenshot. Note: – I will suggest you to implement this first on your developer org, test it and then move it to production. The same approach will work for case assignment rule. Download Apex and Test class from GitHub.